Dr. Brooke Miller is researching how students receive their information about current events. Full Name: Dr. Brooke M. Miller. Title: Associate Professor of Political Science. Degrees: Doctorate of Philosophy in Political Science from the University of Mississippi, Master of Arts in Political Science from Baylor University, Bachelor of Arts in Political Science from North Georgia College and State University (now University of North Georgia). 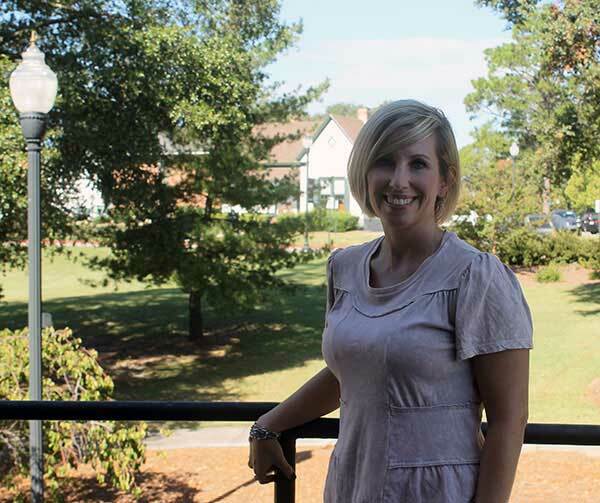 "While at Middle Georgia State, I have had the opportunity to teach so many great students! It is an honor and a privilege to be able to teach them every day. This is the best part of job - getting to go into the classroom every day and engage with students. My students are the basis for my latest research with Dr. Rebecca Nees focusing on how students receive their information on current events. "Furthermore, I have been afforded the platform to further my community service. MGA students in my classes have been generous enough to participate in food drives to benefit local charities, as well as the Georgia Canine Rescue and Rehabilitation. Most of the organizations look forward to the donations from my classes to help them carry out their missions. "Lastly, being a professor at MGA, I have been lucky enough to be asked to appear as an expert on Fox 24 in Macon - a special thanks to Shannon Lily for all of her reports. More recently, I was interviewed by the Macon Telegraph regarding redistricting. Additionally, I have been given the opportunity to work with various publishers to contribute to different book projects. I have presented papers and been able to participate yearly at the GPSA. And this year, I am looking forward to attending the APSA Teaching and Learning Conference." "The family feel among the faculty and staff. I like that about our University - the sense of community." "Being able to do what I love. If you love what you do, you really don't work." In your opinion, what does it take for students majoring in your discipline to be successful these days? "Students need to know that it takes tenacity to succeed - never quit trying and never give up. You will fail sometimes and that is okay as long as you keep trying." "Maybe that my role models include Queen Elizabeth and Teddy Roosevelt."